In a little more than a year, chef Edouardo Jordan has gone from rising star to local culinary celeb. He first wowed us with his rustic open-fire cooking at Matt Dillon’s Bar Sajor, where he was chef de cuisine. Now, Jordan, 35, has opened his own restaurant, Salare, in Ravenna, where he lives with his wife and son. Within the airy, 2,400-square-foot space (a former Patty’s Eggnest), Jordan is creating the kind of thoughtful, detail-oriented nose-to-tail dishes that diners don’t forget. The name Salare, which means “to cure” in Italian, is a nod to his love of charcuterie and ancient cooking methods. After stints at Per Se and The French Laundry, Jordan spent a month in Italy learning the art of charcuterie. However, his cuisine is also influenced by the bounty of the Pacific Northwest along with the long Sunday suppers of his childhood in Florida: Fried okra is gussied up with burnt lemon and saffron ($9); and cracklings ($9), with crème fraîche and salmon roe. To realize his dream restaurant, the chef/owner scraped together bank loans, family money and Kickstarter funds. He also relied on friends and his own hammering skills to nail down final touches, such as the walnut-topped tables and light fixtures that resemble giant, upside-down votives. At each table, Seattle artist Jill Young Rosenast’s seashell-like porcelain vessels (made especially for Salare) give the restaurant an oceanic ambiance. n a little more than a year, chef Edouardo Jordan has gone from rising star to local culinary celeb. He first wowed us with his rustic open-fire cooking at Matt Dillon’s Bar Sajor, where he was chef de cuisine. Now, Jordan, 35, has opened his own restaurant, Salare, in Ravenna, where he lives with his wife and son. Within the airy, 2,400-square-foot space (a former Patty’s Eggnest), Jordan is creating the kind of thoughtful, detail-oriented nose-to-tail dishes that diners don’t forget. 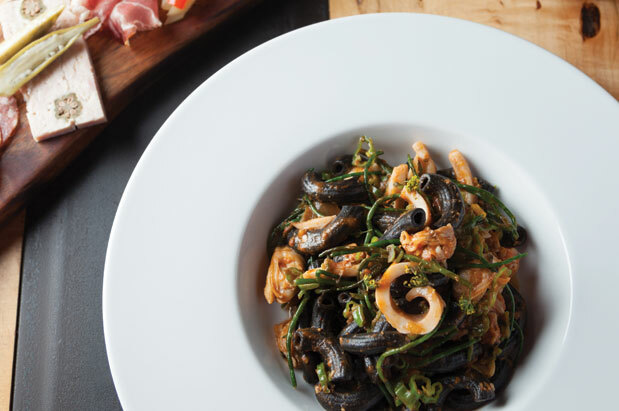 There is seafood to match that marine vibe, including delicious handmade fettuccine ($21) dotted with clams, sea beans and the most delightful shavings of naturally crunchy geoduck. We also loved the duck breast, lightly roasted in cinnamon ($25), with silky chicken liver mousse. But the rotating salumi and charcuterie plate ($12–$26) is especially memorable. On our visit, it featured lardo, guanciale, coppa and offal terrine—which was off-the-charts fresh and toothsome. If you’re still wondering what type of cuisine Salare serves, it can’t be pigeon-holed. It’s a blend of everything that makes Jordan a chef to watch, and well worth a visit to find out why firsthand. Ravenna, 2404 NE 65th St.; 206.556.2192; salarerestaurant.com J.Y.In a little more than a year, chef Edouardo Jordan has gone from rising star to local culinary celeb. He first wowed us with his rustic open-fire cooking at Matt Dillon’s Bar Sajor, where he was chef de cuisine. Now, Jordan, 35, has opened his own restaurant, Salare, in Ravenna, where he lives with his wife and son. Within the airy, 2,400-square-foot space (a former Patty’s Eggnest), Jordan is creating the kind of thoughtful, detail-oriented nose-to-tail dishes that diners don’t forget.The name Salare, which means “to cure” in Italian, is a nod to his love of charcuterie and ancient cooking methods.